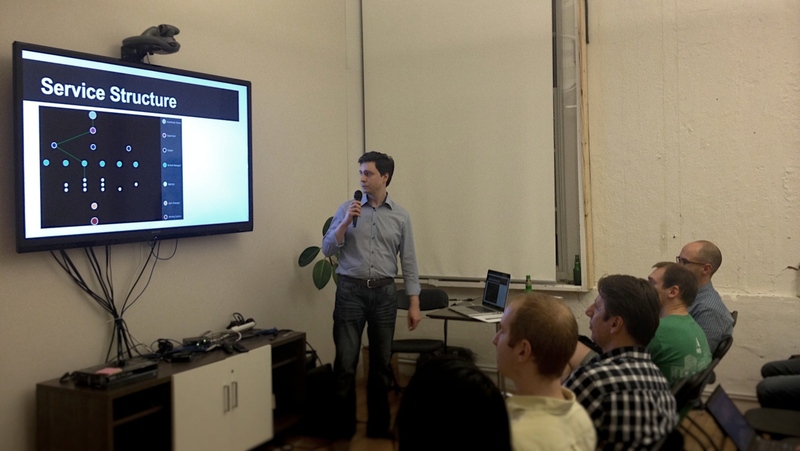 I hosted the first event for ReactiveTO on July 24th. It was fantastic evening filled with great talks on reactive programming principles, microservices, Akka, and ReactiveCocoa. Simply put, with 2.9 billion people now using the internet, our old tricks and techniques of developing robust software must adapt. Language and framework tribalism will play a very small role in the upcoming big shift towards Reactive programming, so it was wonderful to meet other developers with the same point of view. The common factor uniting us all is the desire to build better software. Aleksey Nikiforov demonstrating a live real-time heartbeat app in Akka. A big thanks goes out to my fellow presenters, in no particular order: Dejan Glozic (IBM), Sergey Gavrilyuk (Qwrty), Aleksey Nikiforov (PagerDuty), and Nurun Toronto for hosting our first event.